Why to develop the new video conferencing systems on software-based codec? "Why to develop the new video conferencing systems on software-based codec?" Software-based video codecs, for a variety of reasons, offers developers and users the flexibility needed to upgrade information and technology as it is needed, thereby eliminating expensive hardware. The advent of software-based codecs, compared to hardware-based codecs, offers value in many ways. 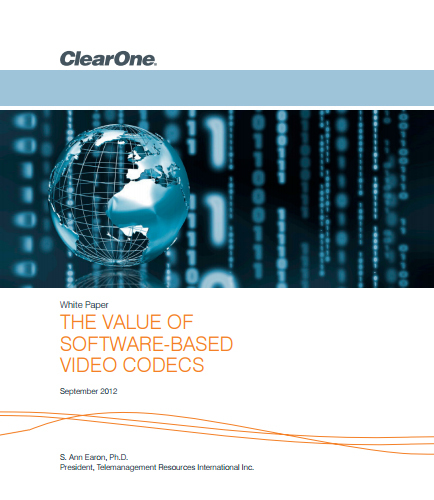 This whitepaper provides insights that will help you to understand the value of software-based codecs as part of today’s collaborative tools. How to meet the customer needs? Dynamic changes in the global communications environment – decreasing network and equipment costs and the need for businesses to compete in a global economy – continue to propel the adoption of video conferencing at a rapid rate. For those organizations who have found video conferencing of value, the process they followed to drive adoption helped make video conferencing a necessary tool for successful business. This whitepaper helps to identify what needs to be done to drive adoption of video conferencing so it becomes second nature to users and a technology deemed a necessity to business. Ways to make your adoption of video conferencing easier and more worthwhile to your organization: What is your benchmark for success? Why one should implement video conferencing? What is video conferencing going to do for an organization? What will be done with video conferencing once it is installed?